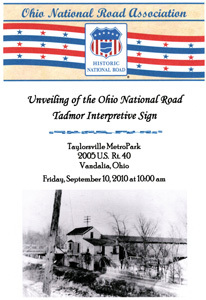 The ninth Ohio National Road Interpretive sign, commemorating the once-thriving village of Tadmor, was unveiled on September 10, 2010 at the Taylorsville MetroPark, located at 2005 U.S. Rt. 40, Vandalia, OH 45377. 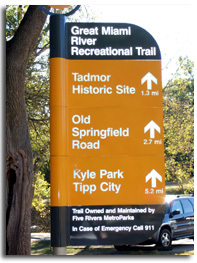 The sign is located near the trail head of the Great Miami River Recreational Trail, and can be accessed off of U.S. Rt. 40 at the west end of the Taylorsville Dam. 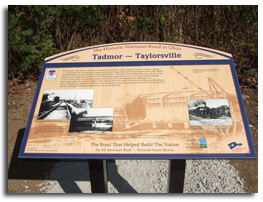 The Tadmor Interpretive sign stands ready to be unveiled near where the historic remnants of the Miami-Erie Canal and the village of Tadmor mix with scenic forests to provide an interesting experience for the traveler, hiker or bicyclist. 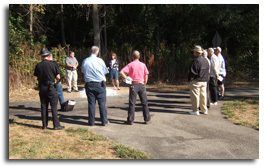 Superintendent of Park Services and Ohio National Road Association Board member, Mark Davis listens as ONRA President Cyndie Gerken offered appreciation to him and those Taylorsville MetroParks employees in attendance, as well as to Five Rivers MetroParks Executive Director, Charlie Shoemaker. Special thanks also went to Mr. Charles Chambers. President Gerken recognized others present for the unveiling, including Glenn Harper for his exemplary work with the Ohio Historic Preservation Office and service to the Ohio National Road Association. 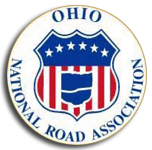 Members of the Historical Society of Vandalia-Butler including President Joe Dranschak, Vice President Bob Walker, and Tim Garwood were acknowledged, as well as Ohio National Road Association Board members Ed Kemper and Paul Seibel. 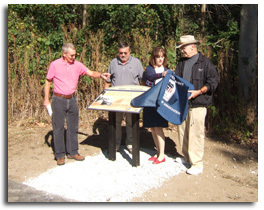 The Tadmor Interpretive sign is unveiled by (left to right): Glenn Harper, Mark Davis, Cyndie Gerken, and Tim Garwood. 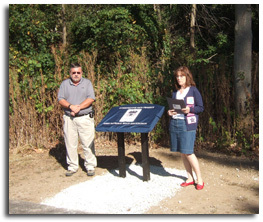 Tim was additionally recognized for his research and creative talents which have brought the history and memory of Tadmor back from the ruins in the form of a remarkable display at the Historical Society of Vandalia-Butler’s Museum and on this newly-unveiled sign. 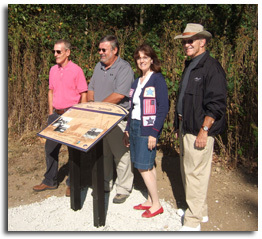 Posing behind the beautiful Tadmor Interpretive sign are (left to right): Glenn Harper, Mark Davis, ONRA President Cyndie Gerken, and Tim Garwood. 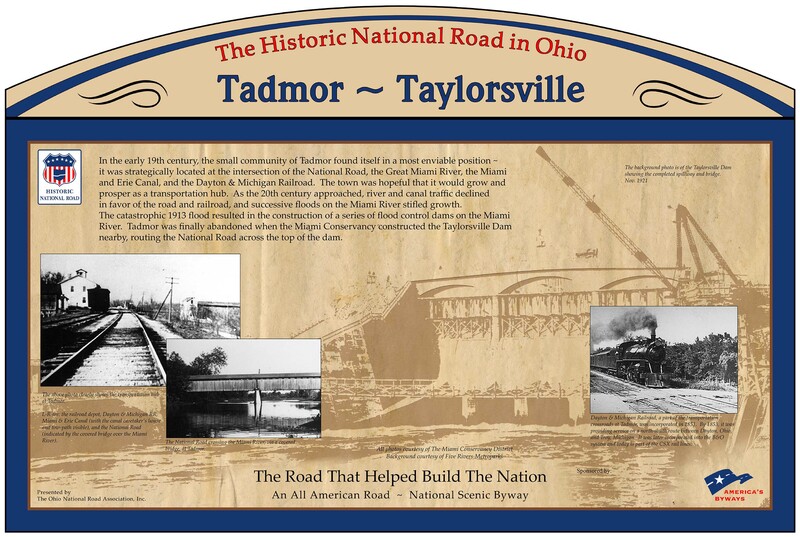 The sign details Tadmor’s storied history and eventual demise at the site of this once important center of transportation in early Ohio history. 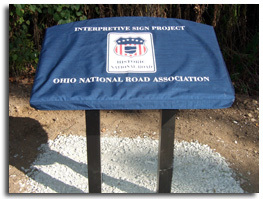 Cyndie concluded the ceremony by thanking the Ohio National Road Association Board of Trustees and specifically the entire Signage Committee for their tireless efforts in reviewing and editing original drafts, so that we could have the most accurate and interesting interpretive signs possible. Signage donors and sponsors, as well as business, family and individual members of ONRA were commended for making this project possible.